We may have many responsibilities in life – our jobs, our families, looking after our homes and our friends and much more. But do we remember to look after ourselves? When we remember self care, all the other areas of our lives benefit. Our relationships improve, our work flows more easily, we remember to enjoy life and all the blessings it brings. 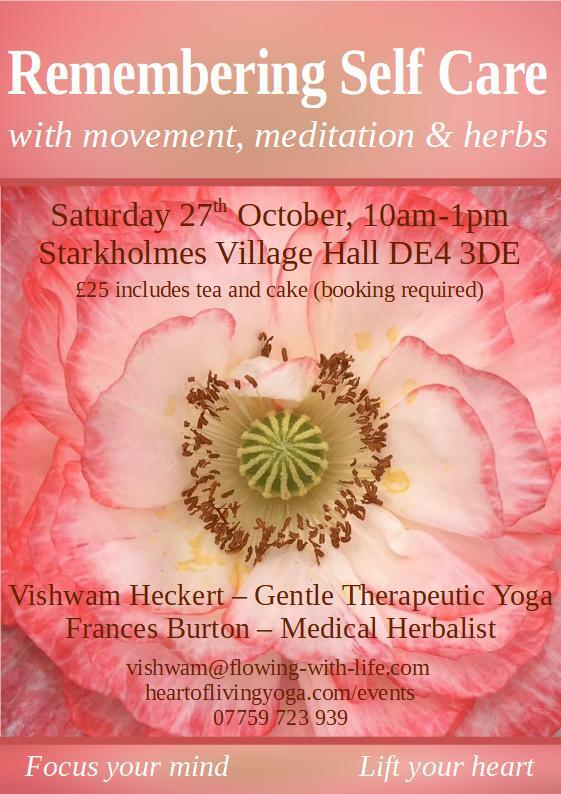 In this special morning of Remembering Self Care, we will explore enjoyable and practical methods for being kinder to ourselves including gentle movement, heartfulness meditation and herbal wisdom which you can incorporate into your every day life. We will be working with herbs that will focus our minds and lift our hearts. The workshop costs £25 and includes tea and cake. There will also be herbal products, meditation CDs and more available for sale should you wish to take more from the workshop home with you or to share with others.